Award-winning filmmaker Alejandro Amenábar’s (The Others, The Sea Inside) latest psychological thriller Regression features an ensemble cast led by Academy Award nominee Ethan Hawke(Boyhood, Training Day, The Purge), and Emma Watson (Harry Potter, Perks of Being a Wallflower). Hailed as a “carefully-crafted tale of collective psychosis” by the Hollywood Reporter, Regression also stars David Thewlis (Harry Potter, Anomalisa), Dale Dickey (“True Blood”) and Devon Bostick (“The 100”, Diary of a Wimpy Kid). Minnesota, 1990. Detective Bruce Kenner (Ethan Hawke) investigates the case of young Angela (Emma Watson), who accuses her father, John Gray (David Dencik), of an unspeakable crime. When John unexpectedly and without recollection admits guilt, renowned psychologist Dr. Raines (David Thewlis) is brought in to help him relive his memories and what they discover unmasks a horrifying nationwide mystery. In 1990, Detective Bruce Kenner (Hawke) is assigned to investigate the case of a young girl, Angela (Watson), who has accused her father of sexual abuse. When Kenner questions her father, John Gray (Dencik), he confesses to the crime, even though he has no memory of committing it. Kenner asks psychologist, Dr. Raines (Thewlis) to work with Gray and help him regain his memory. But as they work together and investigate, Kenner begins believing that another detective, George Nesbitt (Aaron Ashmore), is involved and is part of a satanic cult. As Kenner investigates, he begins having nightmares of the cult and when he meets with Angela, she shows him the mark left on her body form the cult and tells him of some strange phone calls and looks her mother received before her untimely and strange death. After hearing that, Kenner begins noticing strange looks on the street and suspects they are all part of the cult. 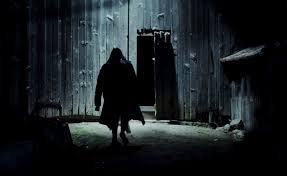 One evening, Bruce is attacked by two hooded figures and after fighting with them, finds out that it’s Nesbitt and another police officer, Farrell (Aaron Abrams). Kenner convinces Nesbitt to tell him everything he knows about the situation and once he’s got the information, Banner goes to Angela to hear her side of the story. Kenner suspects that Angela is not telling the truth and when he asks her about it, she sticks to her story and threatens to tell everyone that Kenner kissed her. Bruce realizes that Angela is lying to get away from her family and goes to tell her father. But John sticks to his confession and goes to jail thinking that this might make up for his being a bad father to Angela. Regression bored me. I am a fan of Ethan Hawke and, of course, Emma Watson, but this story just bored me. I don’t know if it was because it took place in 1990, or what, but I just couldn’t get into it. That’s not to say that the actors didn’t do a good job in their roles, they did. 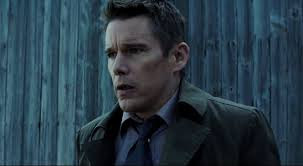 Ethan Hawke is believable as the detective and Emma Watson is really good in a serious role. Her character was sympathetic until the point where you realize she’s being manipulative. Unfortunately, because the story didn’t entertain me, I found myself checking the time, looking at my phone, and just in general, not wanting to finish the movie. I wish the story had been stronger, because I think it had a lot of potential and I hope that I would have enjoyed it a bit more. The direction was good… Alejandro Amenabar is a good director, I really enjoyed The Others and I think he did a good job. As the writer, though, I think there were some issues with the story, and he could have made some different decisions. Regression’s 1080p widescreen presentation was really good. The story itself was dark and the picture reflected that. The color scheme was drab and muted and it was perfect for the movie. Inside and night shots were just dark enough to make it hard to see, but light enough to see without an issue. The video was easily the best part of the disc. The English 5.1 DTS-HD master audio was also good. Dialogue was easily heard, and the soundtrack good. I didn’t have a hard time hearing the movie and the volume level was consistent. Spanish subtitles are available if needed. I was really disappointed in the special features. With a running time of just under 10 minutes, the four short features left me wanting more. Ethan Hawke – Bruce’s Obsession – Ethan Hawke discusses his character and the obsession with the case. 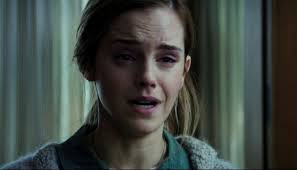 Also included were interviews with writer/director Alejandro Amenabar and Emma Watson. Emma Watson – The Complexity of Angela – Emma Watson, Ethan Hawke and director Alejandro Amenabar talk about the character of Angela. The Cast of Regression –A brief review of the characters – who they are and what happens to them once they interact together. The Vision of Regression – A short review of the movie and how it all came together. Included in this feature are interviews with the cast and director. Regression is a movie that had a lot of potential. With Ethan Hawke and Emma Watson in the lead roles, I expected more of the movie. The story didn’t keep me entertained, though it was visually good. Unfortunately, I likely won’t watch Regression again, it just wasn’t for me.